We need the librarian - today Al decided to sort some of the books he brought along to read on the Alventure. When will we have time for all those museums? 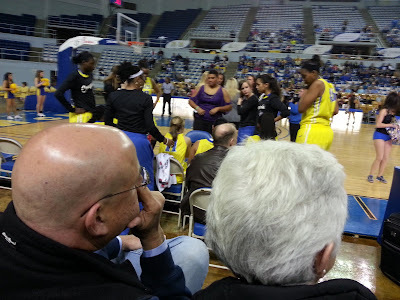 Robert snapped this one to prove that we really went to a McNeese State University Cowgirls basketball game. There might be an issue with the glare from the white hair and the shiny head. Al was challenged while "cutting" his hair by a stubborn cowlick, but he finally got control of it. 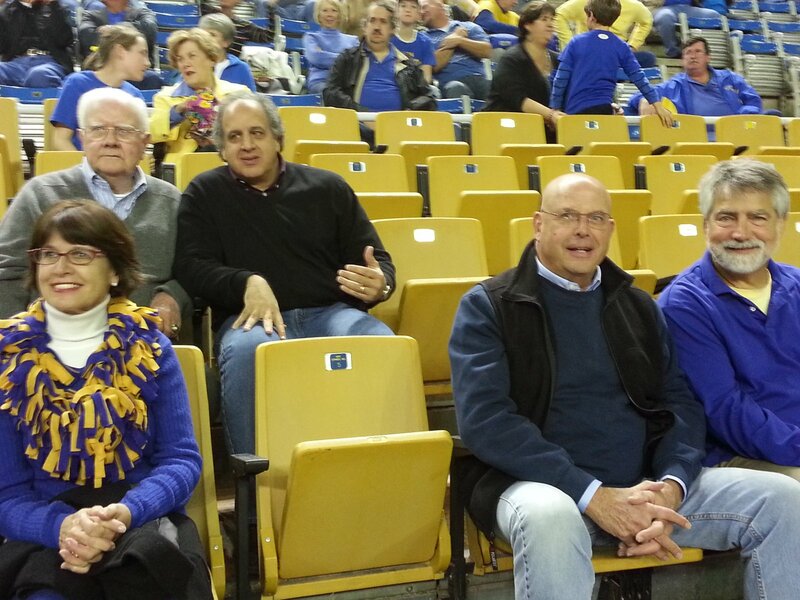 Julie, Robert's friend Wade, Robert, Al, and Dr. Mike cheering on the team. Lake Charles is fun. But not in the summer - too much heat and humidity, thank you. Yesterday Tom Dually got a new roll-top cover and today was his first bath. It's been reported that all went well. Aren't you relieved to hear it? Bummer that the photos didn't turn out well. Remember the day I told you about when we took a tour to Galway Bay and the Cliffs of Mohr? Here is proof of that - on an incredibly rainy and windy day. Do you see the pot of gold and the leprechaun? I do. We're in Lake Charles and have been eating since we crossed the city limit. Al and Robert decided to make a couple batches of ice cream. It would be rude not to taste it, right? Julie went all out with turkey, dressing, potatoes, gravy, etc. Delicious - and plentiful. Yes, there is also a ham, pumpkin pie and pecan pie. All this for six people. Good thing we go back to Homer each evening or we'd have to stay up all night to eat. We are thankful for all of our friends and hope that you had a day/weekend filled with happiness and calories. Black Friday is over so now it's safe to go out again. Again, what's not to love? Go Navy! Go Packers, too. I was following the game from my phone while we toured the museum and saw dozens of planes, representing the history of aviation, naval in particular. Would you want to be one of the three guys who spent 28 days in here? It's a big beautiful museum. We were there for over four hours, but will probably go back tomorrow to see the second building. And maybe a sailer or two. 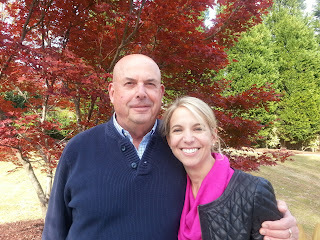 It's been a wonderful three weeks in Atlanta with Chrissy and her boys. We've had more fun that can be related in such a small space, but tomorrow we'll be moving on to Pensacola. I'll be back with more news from Florida. We're still having a wonderful time in Georgia, but won't bore you with excessive gushing about how fabulous Chrissy and Nick and Matthew are. including the famous and friendly Miss Molly Malone with her wheelbarrow. Some very clever people in Dublin have made the former St.Mary's church into a restaurant called - can you guess - The Church. Arthur Guinness was married here, Sean O'Casey was baptized here, John Wesley preached his first Irish sermon here, Jonathan Swift attended services here. This is the Renatus Harris organ (doesn't mean anything to me, but apparently is important to organists) on which Handel practiced The Messiah, which he first performed to a full-capacity crowd of 700 in the Fishamble Street Hall on April 13, 1742. In order to cram everyone in the hall the ladies were requested to not wear hoops in their skirts and gentlemen to remove their swords. Crispy fish on mashed potatoes. I really liked the fish but was a little bit jealous of Al's pot pie. We've been enjoying everyday life in Atlanta. Last night was Matthew's 7th grade string orchestra concert. He looks really good with his violin but my photos were disappointing. Darn. Matthew, the future soccer star!